Affluent investors, surveyed in November by Spectrem Group, reported that news stories about the political climate were having the biggest impact on shaping their economic outlook. In December, they were asked what they consider to be the most serious threat to achieving their household’s current financial goals. The political climate, again, is uppermost on their minds. Twenty percent of these investors said that they considered the political climate to be the most serious threat to achieving their household’s current financial goals. The next largest percentage (15 percent) cited market conditions, while 9 percent said inflation and 8 percent said the economy. Just three percent said they con­sidered the international situation to be the most serious threat to achieving their household’s financial goals at this time. This looks to increase if there is an escala­tion in tensions with Russia, the conflict in Syria and continued ISIS threats. Affluent investors who identify as Democrats are more sensitive to the political climate since the election. The December Spectrem Affluent Investor Confidence Index and the Spectrem Millionaire Investor Confidence Index for these investors each dropped below that of their Republican and Independent counterparts for the second consecutive month. Likewise, while the Spectrem Affluent Household Outlook, a monthly measure of four financial factors that impact these investors’ daily lives, surged to a 19-month high in December, for Democrat-affiliated investors, it is at 6.94 pts compared with 34.37 pts. for Independents and 43.7 pts. for Republicans. But now that the election has provided closure, concerns about the political climate may be easing. 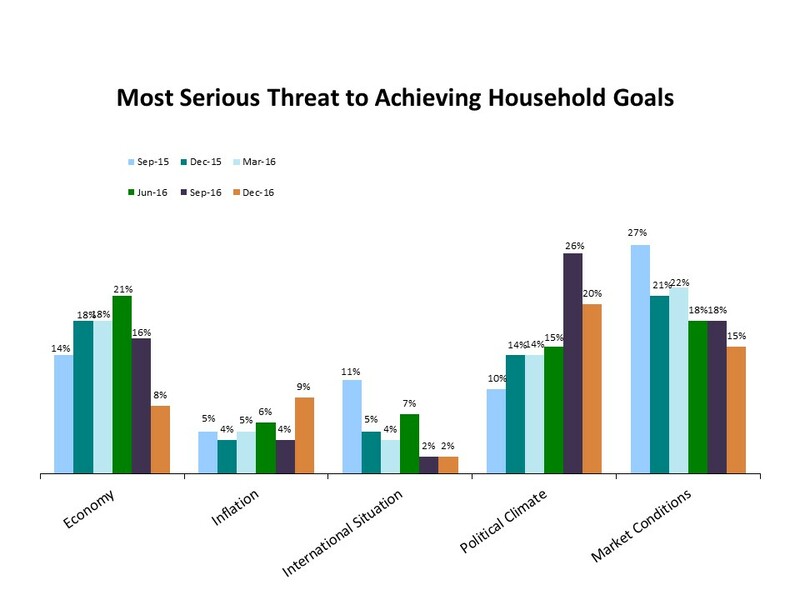 When Affluent investors were asked in September what they considered to be the most serious threat to achieving their household’s current financial goals, 26 percent said the political climate. Affluent investors, too, indicate less concern about the economy (16 percent in September vs. 8 percent in December) and market conditions (18 percent in September vs. 15 percent) as perceived serious threats to achieving their household’s financial goals at this time. While the percentage is small, there was an increase in December in Affluent investors who cited inflation as the most serious threat to achieving their household’s current financial goals (9 percent in December up from 4 percent in September). This may be related to the Federal Reserve’s Dec. 14 announcement it would raise interest rates for the second time in a decade. The immediate months following the January inauguration will present a clearer picture of how Affluent investors will react to President Trump’s first 100 days in office.